White Skull Button Up Shirt with Sleeve Stripe. Give your gothic skull shirts a sleek upgrade with this men’s skull button-up shirt by Open. White button-up shirt features graphic skulls and roses in black with scroll detail inspired by tattoo art. 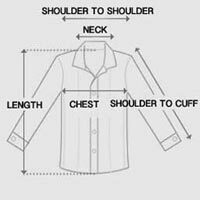 Slim fit shirt includes front button closure, two-button cuffs and standard collar. Long sleeves are detailed with a wide black stripe designed with "opening ceremony" graphics that runs from collar to cuff. When you need alternative tops with modern vibes, go for this skull button-up shirt for men. Model is wearing size XL. Sizes are measured in inches. For accurate measurements, check the table below.